New parents have a lot to worry about, and looking after their newborns skin is one such concern. Eczema in infants is fairly common and although some types may be unavoidable, it may be possible of minimising the risk of developing a form called contact eczema. Baby eczema can come in two forms; atopic eczema meaning it can occur regardless of your best efforts and may be linked to genetic factors, and the other is known as contact eczema. Both forms begin as a skin irritation resulting in area of redness, dry patches that are itchy and inflamed and may develop to being sore, weepy, cracked or bleeding. It is important to try and determine if the eczema can be avoided by eliminating some of the more likely causes and to try and get on top of it before it deteriorates into being painful with open sores. 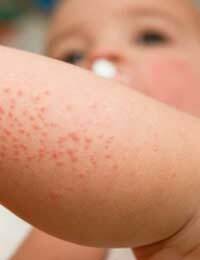 What Links Exist Between Baby Eczema and Allergies? Although experts tend to agree that eczema is not necessarily an allergic reaction, it is thought that some forms may be related to specific products that act as allergens. These typically include dietary sources, reactions to certain chemicals found in many soaps, washing detergents and fabric softening products (though these claims are currently being researched), or in fact from being too warm or because of the nature of the fabric that is in contact with their skin. In the first instance it is worth refraining from using fabric conditioners for a while and changing your washing powder to a non-biological brand that is softer to your baby’s skin as they contain less or no enzymes that can irritate the skin. If your baby also tends to suffer from regular bouts of sickness and diarrhoea, you may want to speak to your health visitor about a possible change in their diet. Common food products that can trigger eczema include cow’s milk, soya and wheat products. By gradually eliminating each type of these foods (making sure you find a safe and suitable replacement) you may be able to find out which your baby is most sensitive to. If your baby tends to get quite warm, try dressing them more suitably; perhaps you could exchange a woolly jumper with a softer fleecy top or cotton sweatshirt. Also by making sure that baby is dried properly after bathing, their skin is less likely to become sore and inflamed. Take extra care when drying around their creases and face as these are the areas that may suffer a flare-up. Using appropriate moisturisers carefully after their bath will also help; avoid scented or coloured products that contain unnecessary and unneeded chemicals that can aggravate episodes of dryness in your baby’s skin. The best fabrics for both your baby’s clothes and their bedding, is soft clean cotton items that are soft and non-irritant to the skin. Baby eczema can develop very quickly and can deteriorate from a patch of redness to a very sore and angry looking area equally as quickly so it is important to try and prevent the occurrence before this is permitted to occur when able.